SPACrown Prince Mohammad bin Salman met Jamal Khashoggi’s son in Riyadh on Tuesday. The journalist Jamal Khashoggi’s children have been barred from leaving Saudi Arabia, according to his editor at The Washington Post. Khashoggi was often critical of the Saudi government in his reporting, which led Saudi leadership to restrict the movements of his family, the editor said. Khashoggi was killed in the Saudi Consulate in Istanbul earlier this month. Jamal Khashoggi’s children have been barred from leaving Saudi Arabia, according to his editor at The Washington Post. Khashoggi, a Saudi journalist who was often critical of Riyadh in his reporting, was killed in the Saudi Consulate in Istanbul earlier this month. His death has sparked international condemnation and put major strains on US-Saudi relations. Khashoggi, once a prominent journalist in Saudi Arabia and an adviser to the royal family, left last year after Saudi leadership barred him from writing. Khashoggi expressed concern about Crown Prince Mohammed bin Salman’s efforts to consolidate power, which included arresting fellow princes and businessmen. After departing Saudi Arabia, Khashoggi began writing for The Washington Post and continued to criticise the Saudi government. Khashoggi became a US resident, splitting his time between Virginia, Istanbul, and London. Karen Attiah, the global opinion editor at The Post, has been particularly vocal about the situation for Khashoggi’s four children, three of whom, she said, have dual US citizenship. Attiah added that Khashoggi had told her that what “saddened him the most was the fact Saudi Arabia imposed travel bans on his kids after he started writing for” The Post. Loveday Morris, a reporter at The Post, expressed similar sentiments in a tweet. Saudi state media on Tuesday published photos of Jamal Khashoggi’s son Salah Khashoggi with Saudi Arabia’s King Salman and Prince Mohammed. His other son, Sahel Khashoggi, was also in attendance. Salah Khashoggi has been barred from travelling since last year,a friend of the family told The Associated Press. Prince Mohammed is suspected of orchestrating the events that led to Jamal Khashoggi’s death. 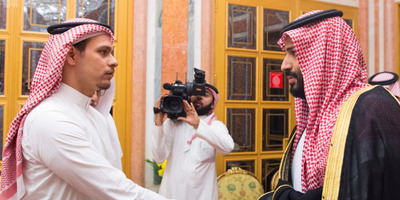 Many said they noticed a painful look on Salah Khashoggi’s face when he met the crown prince. The Saudi Embassy in Washington, DC, did immediately respond to Business Insider’s request for comment. It’s not clear whether President Donald Trump has broached the topic of the Khashoggi family’s travel in his discussions with the Saudi government over Khashoggi’s death. The White House did not immediately respond to a request for comment.